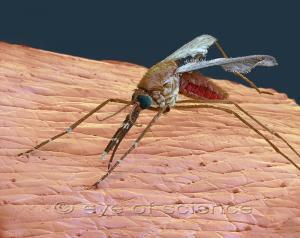 There are around 3,500 different species of mosquitoes worldwide with about 100 in Europe and 170 in North America. Different species may have completely different ways of life. Whereas certain species appear in relatively low densities, others may appear in tremendous numbers of individuals, after floods, for example. There are also differences with respect to diet: There are mosquito species that have specialized in specific hosts, whereas others bite anything they encounter more or less indiscriminately. These different forms of behavior may have an important influence on the role that mosquitoes play as a transmitter of diseases. One thing all mosquitoes have in common is that they spend their immature stages in the water.